With a quirky see-through design and some high-end specs, the Xiaomi Mi 8 Pro is an impressive way for the brand to kick things off in the UK, but it’s not the only classy cruiserweight in town. Xiaomi is a massive name in its native China, but it isn’t yet a global household name like Huawei. The Xiaomi Mi 8 Pro is a good demonstration of why that’s the case. This has got nothing to do with this new flagship smartphone’s quality. It’s actually really rather good. No, it’s down to the fact that this is the first Xiaomi phone to receive an official push in the UK. The company has appeared reluctant to do more than dip its toe into international waters for several years now. But it could make a considerable splash with the Xiaomi Mi 8 Pro. This is a well-spec'd, boldly designed smartphone at an appealing price. With an asking price of £499 (around $625 / AU$900), the Xiaomi Mi 8 Pro joins a growing roster of phones that provide flagship levels of performance at around half the price of the biggest hitters. You might question the concept of a £500 bargain, but the current reality is that a new top-end phone from Apple, Samsung, Google or Huawei will set you back around double that. There’s a yawning gap between the mid-range and the top-end, and phones like the Xiaomi Mi 8 Pro are well positioned to fill it. 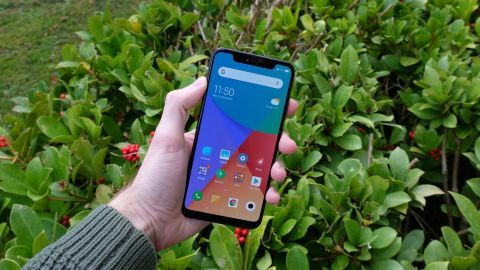 The Xiaomi Mi 8 Pro is available to buy SIM-free directly from Mi.com, as well as from Amazon, Argos, John Lewis, Carphone Warehouse, Currys PC World, Very, Gomobile, Mobile Phones Direct, and Katana. You can also buy it on contract from Three. With its notched display and vertically-stacked dual-camera set-up, the Xiaomi Mi 8 Pro is clearly another phone in thrall to the iPhone X. But it only takes a cursory glance at the rear of the phone to see that it’s offering something a little bit different on the design front. You can seemingly see right through the Gorilla Glass rear cover to the Mi 8 Pro’s various chips. And very photogenic they are too, with several of the components given a little inspirational line of text - “be the coolest company in the hearts of our users”, for example, or “always believe something wonderful is about to happen”. If it all looks suspiciously neat and photogenic, that’s because these components are fakes. The real engine room is stashed away deep within the bowels of the phone. Which, when you think about it, is quite reassuring. We have mixed feelings about this approach. On the one hand, Xiaomi is trying something different with the design of the Mi 8 Pro, and in a very safe and settled smartphone market that bravery is to be commended. Our inner 12-year-old also found a certain geeky charm to the design. But it’s also just a little bit tacky. There’s a brazen allure to a phone flaunting its hidden parts for everyone to see, but finding out that those parts have been artificially embellished cheapens the effect somewhat. Xiaomi hasn’t limited its showing off to the rear of the Mi 8 Pro, either. It’s easy to miss with that distracting see-through back, but there’s no fingerprint scanner on the rear of the phone. Nor is there one on the front. Rather, Xiaomi has followed in the footsteps of the OnePlus 6T and Huawei Mate 20 Pro by offering an in-display fingerprint sensor. You’ll find it roughly a third of the way up the phone, right in the middle of the display. Touching the screen or hitting the power button will reveal the hidden location of the sensor with a telltale fingerprint icon, but all you need to do to use it is press and hold. It works reasonably well in our experience, but it doesn’t seem to be as reliable as the latest generation of dedicated fingerprint sensor. It’s also a fair bit slower, and it requires you to press more firmly than you might be accustomed to. It’s likely the case that subsequent generations of in-display sensor technology will improve dramatically, just as standalone sensors have come along a fair amount since the early days of Touch ID. It works, and it’s undoubtedly cool to be able to unlock your phone in this way. But right now it’s not as practically effective as cheaper, more conventional methods. While the Xiaomi Mi 8 Pro sets out to catch the eye by flashing its bits at us, there’s nothing outrageous about its general shape or dimensions. This is a solid mash-up of iPhone X and generic Android elements, with a vertical dual-camera lozenge and notched edge-to-edge display culled from the former and a curved back and gently rounded aluminium edges that suggest something like the Samsung Galaxy S9 or OnePlus 6T. Squint a little, and the Mi 8 Pro’s footprint could be any number of phones from the past few years. It’s a pleasant phone in the hand, with a 177g weight proving hefty but not cumbersome. It’s quite skinny at 7.6mm, too, and combined with minimal bezels it shouldn’t stretch a standard trouser pocket too much. Xiaomi has joined Huawei and Google in adding a welcome splash of colour to the side buttons, with a red power key helping it to stand out from the darker hues elsewhere. It’s a shame the button doesn’t have the texture of something like the Huawei Mate 20's power button, though, with a smooth finish that makes it feel almost identical to the adjacent volume rocker. We’ve discussed the inclusion of an in-display fingerprint scanner, but we should probably run through a few noteworthy omissions. There’s no 3.5mm headphone port here, because it’s 2018. Time to go wireless if you haven’t already. While we wouldn’t label that omission as a glaring oversight - more of a calculated decision - the lack of meaningful water resistance is tougher to let slide. We’re not seeing any form of official IP rating for the phone, which means you’ll expose it to water at your peril. We don’t exactly expect such a feature within this price category, but it’s something we feel should be present. Such an IP rating is noticeably absent from the OnePlus 6T, but the Huawei Mate 20 sports an IP53 rating. It took us a little while to warm to the Xiaomi Mi 8 Pro’s 6.21-inch display, but we got there in the end. Having come directly from the aforementioned Huawei Mate 20, it felt a little dim and flat to begin with. But the display has its own charms. Unlike Huawei’s similarly priced effort, the screen tech here is AMOLED. So while it doesn’t get super-bright like its rival (few screens do), it does have a nice range of colours and deep blacks, with full HDR10 support. Those colours aren’t excessively punchy or vibrant, either, as AMOLED screens can often be. Everything looks natural and balanced. It’s plenty sharp enough, too, with a 1080 x 2248 or Full HD+ resolution. That’s not the QHD resolution of some top-end smartphone displays, but we’ve found that the law of diminishing returns seems to apply when moving up to that resolution standard. What’s way more important is that there’s none of the pixel fuzziness that can accompany lesser AMOLED displays. This is a clean, balanced display that soothes rather than assaults the eyes. It’s a far more subtle take on AMOLED than you might be accustomed to, but that’s largely for the better.